4.5 stars rounded up to 5 because of the horses! I love fairy tale retellings or re-imaginings and I love Russian folklore, so I was especially excited for this. The first chapter was utterly magical and held me spellbound — and then it was slow going for a while, as the evil in the woods was slowly awoken by little acts – or failures to act – over many years, on the villagers’ part. Once the action picked up again, I found myself turning page after page in my eagerness to know whether Vasya would triumph. Vasya was strong in the best sense of the word – she insisted on living her life on her terms while still remaining steadfastly loyal to her family and village. The horses. Nobody told me this had such delightful equines in it! I’m a sucker for well-written horses. The antagonists. Yes, there were more than one, and all of them were layered, full of believable motivations. As in real life, nothing is simple. 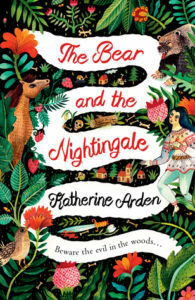 This well-researched and brilliantly written debut novel was a real treat to read on a cold winter night, and I’m looking forward to more from Katherine Arden.